A virtual reality system has been created at Newcastle College’s Energy Academy in Wallsend to help train future engineers in the North East region. 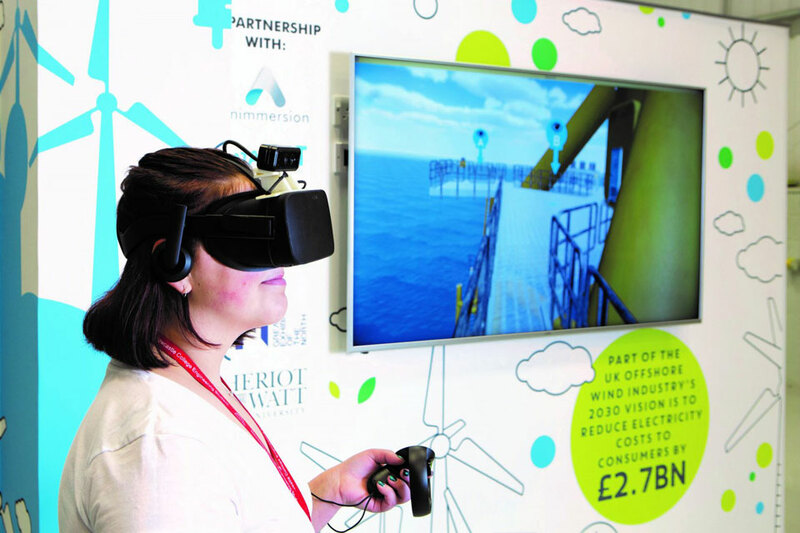 The Immersive Hybrid Reality (iHR) offshore wind training facility has been commissioned for the Great Exhibition of the North and has been delivered by Offshore Renewable Energy (ORE) Catapults, in partnership with Scotland’s Energy Skills Partnership, Heriot Watt University and Animmersion VR, to replicate working conditions experienced by wind turbine engineers operating on offshore wind farms. The VR technology allows users to locate and diagnose faults in a realistic and safe environment, helping develop the skillset needed for working within the wind industry. The new technology part of a national initiative to create 27,000 skilled jobs within the the energy sector by 2030. The Energy Academy opened in 2012 and has already trained over 1,200 students. Speaking at the Great Exhibition of the North, director of Business Partnerships Marc McPake said: “Newcastle College has always been aligned to North East LEP priorities and our training and development here at the Energy Academy is centred around the skills required by industry. “Collaboration with employers is at the centre of everything we do and our partnership with ORE Catapult is a fantastic example of a relationship which will benefit our students and an entire industry.